According to the U.S. Fire Administration (USFA), as of 2014 nearly 4,300 fires occur every year in America on Thanksgiving. Many of these are caused by deep-frying turkeys. The fires cause at least 15 deaths and almost $27 million in property damage. In addition to the danger, and worry, there’s expensive oil to purchase, then either filter for re-use, or you have to figure out how to recycle or dispose of it. 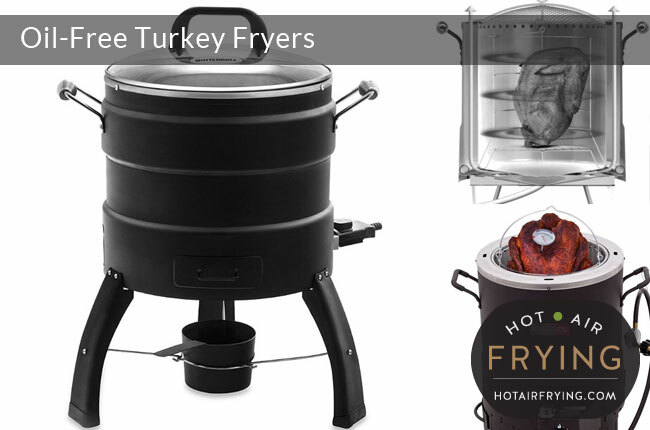 There are now oil-free (aka oil-less) turkey fryers that are far more worry-free and safer to use, and that produce turkeys just as succulent and crisp as deep-frying. Some models are powered by electricity; others by propane. These don’t use forced hot air, so aren’t hot air frying per se: instead, they use radiant heat — infrared heat –to do the cooking. The models we have seen so far all say that they are for outdoor use only. Manufacturers advise to place the turkeys in breast up. Note as well that should you wish, you can experiment with spice rubs on the turkey, as there is no oil to wash the rubs away. Some people do suggest, though, that sugar should not be the major ingredient in the rub or it may harden like lacquer. At other times of the year, some people even use this as tandoori ovens, slapping naan dough, etc, on the interior walls to cook. How much does these oil free turkey fryers cost.????? Hi Barbara, the cost will vary wildly based on what time of year you buy them, what model you get, what country you are in, etc. Have a look on amazon to get an idea of the price ranges.